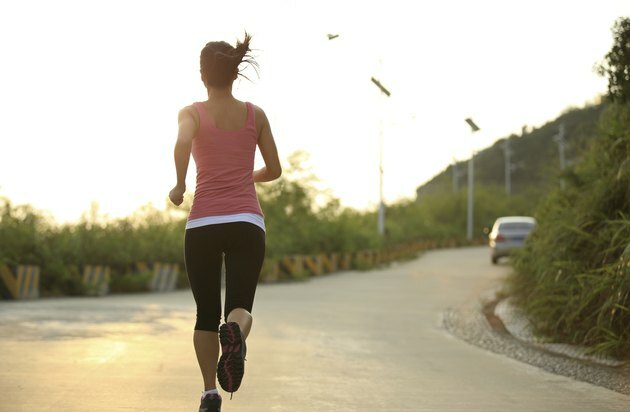 Does Running Make You Thin? Marnie Kunz has been an award-winning writer covering fitness, pets, lifestyle, entertainment and health since 2003. Her articles have been published in "The Atlanta Journal-Constitution," "Alive," "The Marietta Daily Journal" and other publications. Kunz holds a Bachelor of Arts in creative writing from Knox College and is a Road Runners Club of America-certified running coach and a certified pole dance instructor. Running is an effective cardiovascular exercise that can help you burn calories quickly and reduce your chance of contracting conditions like high blood pressure, diabetes and heart disease. If you want to lose weight, running regularly can help you reach your goals. Running doesn't make everyone thin because factors such as body type and diet also come into play, but running can help you get lean and toned as well as burn fat. Running is a cardio exercise that can increase your endurance, improve your fitness level and burn calories. Most people burn about 100 calories per mile of running. If you want to lose weight, you need to burn more calories than you consume. It takes about 3,500 calories to equal 1 lb. of body weight, so if you burn 500 more calories than you consume every day, you will lose 1 lb. in a week. The U.S. Centers for Disease Control and Prevention recommends losing 1 to 2 lbs. per week for a healthy, sustainable rate of weight loss. The exact amount of calories you burn running depends on your weight and how fast and long you run. Generally, the faster and longer you run and the more you weigh, the more calories you will burn during your workout. Harvard Medical School reports a 155-pound person who runs at 5 mph for 30 minutes will burn 298 calories; a 185-pound person who runs for 30 minutes at the same pace will burn 355 calories. The two people will burn 465 and 555 calories, respectively, during a 30-minute run at 7.5 mph. Burning calories is half of the equation of weight loss -- your diet also plays a role. If you burn a high amount of calories running but eat a high amount of calories as well, you will not lose weight. Running will still help increase your lean muscle mass and improve your cardiovascular health, but for the best toning and weight-loss results, pair your running program with a nutritious diet with foods from all food groups, including grains, vegetables, fruit, protein and dairy products. You might conjure an image of a gaunt, skinny marathon participant when thinking of runners. Long-distance running does indeed burn a high amount of calories. Your body taps into fat burning for energy after about an hour of aerobic running and burning carbs. Many distance runners replace the calories they burn in long runs, but still maintain a low body-fat percentage from burning fat stores. You can tap into your fat-burning zone on runs by gradually adding mileage to your weekly long runs. Follow the 10-percent principle, adding no more than 10 percent more distance from your previous week's run. How Much Weight Will I Lose if I Run a Mile Every Day for a Month? If I Run for 30 Minutes a Day, Will I Lose Weight?